How do you “Fake” the Fall Season in Florida and other Warmer Climates? The first day of fall, September 23rd, is almost here and like many, it’s my favorite time of the year. But what does Fall in Florida mean to you? Moving to Florida from Massachusetts many moons ago, it took me several years to realize that fall is just an extension of summer and a little imagination is required. With temperatures still hovering in the mid to upper 80’s until the end of September or early October, the passing of summer to fall is marked by less rain, and the appearance of pumpkin spice latte, which coincidentally, is available as of this morning at Starbucks. While I’m not a coffee drinker, many in my office seem excited about the beverage so I guess it means, fall has arrived early. Since we don’t experience the change of seasons with rich, brilliant fall foliage, I find other ways to create and experience fall. How do you bring the fall season into your home when it’s 85 degrees, the foliage is still green and you’re still swimming in the pool? I begin by putting away all the summer decor such as the floral pink and green dining room table cloth and replacing it with a cloth full of festive fall hues; orange, brown, yellow and red. Then, I scatter my favorite Bath & Body Works 3-wick, Cinnamon smelling candles throughout the home. I change bathroom hand towels to ones embroidered with rust colored leaves, as well as the napkins in the kitchen to a fun, fall inspired print that the kids love, which usually features a jack-o-lantern, witch or skeleton. A nice final touch to complete the transformation is a craft project for my kids; pine cone garland. 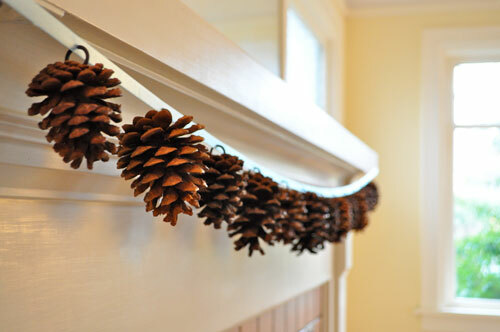 I’ll have them gather pine cones, string them, and they’ll be a nice addition to our mantel. It’s the small changes that really make a difference and begin to make our home feel like fall. Next, I add a few finishing touches outdoors. I begin by planting one of fall’s quintessential flowers, Chrysanthemums, nicknamed “mums,” in a couple of pots. I place a pot where the walkway to and from the front door meets the driveway as well as at the front door. 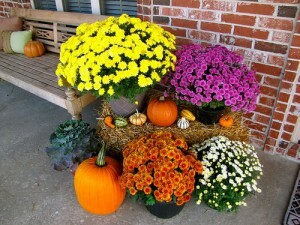 They’re inexpensive and provide a burst of fall color. Then, I place a couple of stacked hay bales at the front door as well as a newly created scarecrow, compliments of my children, on top of the hay along with a ceramic pumpkin. Keep in mind that you may have to be creative stuffing a scarecrow if you make one before the end of October, leaves are usually at a premium. Finally, I fill the air with scents of all my favorite fall and winter dishes which happen to involve my favorite kitchen appliance, the Crock-Pot. Who doesn’t love coming home after work to a home cooked meal and a house filled with the wonderful aromas of stew, pot roast and delicious baked goods? What are you favorite tips and tricks to bring fall into your home? Please share in the comments, I’d love something new to try.